Nancy Reagan, the helpmate, backstage adviser and fierce protector of Ronald Reagan in his journey from actor to president has died. LOS ANGELES (AP) — First lady Nancy Reagan swept into the White House in 1981, a swirl of designer gowns and pricey china, and was quickly dismissed as a pre-feminist throwback concerned only with fashion, decorating and entertaining. She needed a less frivolous image. And she got it. By the time she packed up eight years later, the former movie actress was fending off accusations that she'd become a "dragon lady," wielding secret, unchecked power within Ronald Reagan's administration — and doing it based on astrology to boot. "I'm a woman who loves her husband," she said, "and I make no apologies for looking out for his personal and political welfare." Mrs. Reagan died Sunday at her home in the Bel-Air section of Los Angeles of congestive heart failure. She was 94. She was Ronald Reagan's closest adviser and fierce protector throughout his journey from Hollywood actor to governor to president — and finally during his 10-year battle with Alzheimer's disease. She served as his full-time caregiver as his mind melted away, and after his death in 2004 dedicated herself to tending his legacy through his presidential library in Simi Valley, California. She also championed Alzheimer's patients, raising millions of dollars for research and breaking with fellow conservative Republicans to advocate for stem cell research. Her dignity and perseverance in these post-White House roles smoothed out public perceptions of Nancy Reagan that had been fickle as far back as her days as first lady of California. If Reagan was the Teflon president, family friend and former aide Michael Deaver wrote, then Mrs. Reagan was the "flypaper first lady." Controversies always stuck to her. It may have been because hers was the pricklier personality. While Reagan was amiable and easygoing, Mrs.Reagan was direct and demanding. He was an optimist, she was a worrier. He was overly trusting; she watched for disloyalty from close aides. Reagan hated to fire anyone or even exert discipline; his wife played the heavy, whether with their children at home or the president's staff in the White House. Their differences complemented each other, to the president's advantage. "She took on the tough jobs that Reagan wouldn't or couldn't handle: particularly staff decisions that were sure to make enemies," Deaver wrote in a sympathetic memoir of working with Mrs. Reagan. James Baker, chief of staff in Reagan's first term, told PBS that the first lady "was in all the major personnel decisions. I would never have been in the Reagan White House had it not been for Nancy Reagan." The couple's mutual devotion over 52 years of marriage was legendary. They were forever holding hands. She watched his political speeches with a look of such steady adoration it was dubbed "the gaze." He called her "Mommy" and penned a lifetime of gushing love notes. She saved these letters, published them as a book, and found them a comfort when he could no longer remember her. In announcing his Alzheimer's diagnosis in 1994, Reagan wrote, "I only wish there was some way I could spare Nancy from this painful experience." Ten years later, as his body lay in state in the U.S. Capitol, Mrs.Reagan caressed and gently kissed the flag-draped casket. 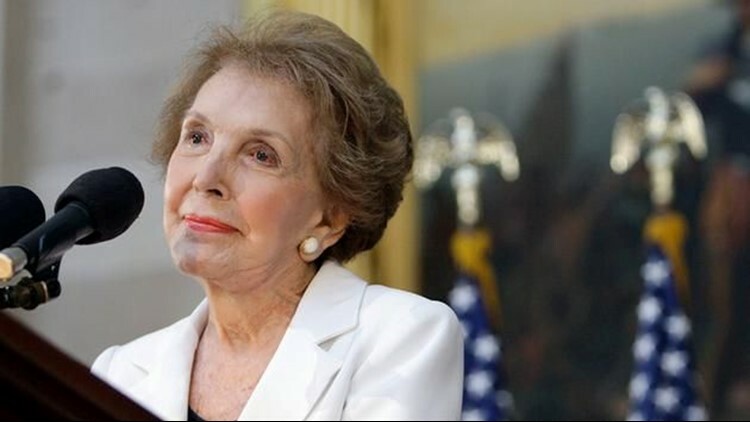 "Our former first lady redefined the role in her time here," President Barack Obama and his wife, Michelle, said in a statement, adding: "We remain grateful for Nancy Reagan's life, thankful for her guidance, and prayerful that she and her beloved husband are together again." Anne Frances Robbins, nicknamed Nancy, was born July 6, 1921, in New York City. Her parents separated soon after she was born and her mother, film and stage actress Edith Luckett, went on the road. Nancy was reared by an aunt until 1929, when her mother left show business and married Dr. Loyal Davis, a wealthy Chicago neurosurgeon. He gave Nancy his name and a socialite's home. She majored in drama at Smith College and found stage work with the help of her mother's connections. In 1949, MGM signed 5-foot-4, doe-eyed brunette Nancy Davis to a movie contract. She was cast mostly as loyal housewives and mothers. She had a key role in "The Next Voice You Hear ...," an unusual drama about a family that hears God's voice on the radio. In "Donovan's Brain" she played the wife of a mad scientist possessed by a disembodied, glowing brain. Acting was never a career, she said, just something to do until she got married. It led her to Ronald Reagan in 1950, when he was president of the Screen Actors Guild, and she was seeking help with a problem — her name had been mistakenly published on a list of suspected communist sympathizers. They discussed it over dinner, and she later wrote that she realized on that first blind date "he was everything that I wanted." The couple made one movie together, "Hellcats of the Navy," but Mrs. Reagan's career tapered off as she embraced her homemaker role. "My life began with Ronnie," she liked to say later, a line that irked feminists. She was thrust into political life when her husband ran for governor in 1966, and found it too rough. "The movies were custard compared to politics," Mrs. Reagan said. Her eight years as California first lady were a preview of her turn on the national stage. After one night in the run-down Victorian governor's mansion she declared it a "noisy firetrap" and moved the family to a 12-room house in a wealthy Sacramento neighborhood, sparking cries of elitism. Known publicly for her glamour and poise, behind the scenes Mrs. Reagan was closely involved in scheduling and strategy. Her blunt questions and frequent phone calls intimidated the governor's staff. "Nancy's style can frighten people," Deaver conceded. As the nation's first lady, she ran into controversy even before her husband was sworn in. After Reagan's1980 landslide, his transition team dropped hints that Mrs. Reagan wanted Jimmy and Rosalynn Carter to vacate the White House before Inauguration Day so she could begin redecorating — considered an unseemly request by many. Mrs. Reagan raised more than $800,000 from private donors to redo the White House family quarters and to buy a $200,000 set of china bordered in red, her signature color. She was criticized for financing these pet projects with donations from millionaires who might seek influence with the government, and for accepting gifts and loans of designer dresses worth thousands of dollars. Her lavish lifestyle — in the midst of a recession and with her husband's administration cutting spending on the needy — inspired the mocking moniker "Queen Nancy." She won better press coverage by spoofing her clotheshorse reputation with a comic song at Washington's annual Gridiron roast. And her travels across the U.S. promoting the "Just Say No" anti-drug campaign for kids and teens helped develop a more serious, sympathetic conception of the first lady. Her substantial influence within the White House came to light only slowly in her husband's second term and afterward. Her familiar stare and frozen smile, formerly disparaged as Barbie-doll vacant, began to be described as steely. She famously helped drive out chief of staff Donald Regan after the Iran-Contra scandal broke under his watch in late 1986. Although the feud between the first lady and the chief of staff had spilled into the papers, the president dismissed reports that it was his wife who got Regan fired. "The idea that she is involved in governmental decisions and so forth and all of this, and being a kind of dragon lady — there is nothing to that," a visibly angry Reagan assured reporters. Years later Mrs. Reagan herself and other insiders confirmed that she had rounded up support for Regan's ouster and persuaded the president that it had to be done. She felt it was proper for the first lady to advise the president on anything, and she did: She urged Reagan to finally break his long silence on the AIDS crisis. According to Lou Cannon's authoritative biography "President Reagan: The Role of a Lifetime," Ronald Reagan agreed at his wife's request in 1987 to speak at a fundraising dinner for the American Foundation for AIDS Research. She didn't trust his speechwriters so former Reagan speechwriter, Landon Parvin, was brought in for the job. She also helped arrange for Surgeon General C. Everett Koop to attend a cabinet meeting and defend the speech against conservative opposition. She also nudged him to accept responsibility for the Iran-Contra arms-for-hostages affair. And she buttressed advisers pushing Reagan to thaw relations with Soviet leader Mikhail Gorbachev, over the objections of the administration's "evil empire" hawks. When accused of overstepping her bounds, and possibly causing the aging president to appear weak or indecisive, the first lady deflected the criticism with humor. "This morning I had planned to clear up the U.S.-Soviet differences on intermediate-range missiles," she told an audience of publishers, "but then I decided to clear out Ronnie's sock drawer instead." Near the end of Reagan's presidency, ex-chief of staff Regan took his revenge with a memoir revealing that the first lady routinely used a San Francisco astrologer's forecasts to guide the president's daily schedule. "Virtually every major move and decision the Reagans made" was first cleared by the astrologer, Regan wrote. The revelation caused a sensation. Mrs. Reagan, who had a longtime interest in horoscopes, maintained that she used the forecasts only in hopes of predicting the safest times for the president to venture out of the White House. She turned to the astrologer "as a crutch," she said, after the shock of almost losing her husband to an assassin less than three months into his presidency. After the shooting, Reagan famously was said to have wisecracked to her, "Honey, I forgot to duck." An anxious Mrs. Reagan had stayed at Reagan's hospital bedside for 13 days as he recovered from the gunshot fired by John Hinckley. From then on, she said, "Every time he went out the door I don't think I took a deep breath until he got back." After she left the White House, a sensational unauthorized biography painted Mrs. Reagan as de facto president and alleged she had cheated on her husband with none other than Frank Sinatra. The book sold well, but author Kitty Kelley's research techniques were ridiculed, and Ronald Reagan lambasted her for "flagrant and absurd falsehoods." Mrs. Reagan also weathered unflattering portrayals in books by daughter Patti Davis. In her memoir, "My Turn," Mrs. Reagan called their estrangement "one of the most painful and disappointing aspects of my life." But Davis reconciled with her parents after her father's illness was disclosed, and she was there holding her mother's hand at his funeral service. Mrs. Reagan spoke of how terribly she missed her husband in her final years. In 2009 she told Vanity Fair magazine how she'd pressed evangelist Billy Graham for reassurance that they would be reunited after death. "He said, 'You are.' And I said, 'OK.'" This report includes biographical material written by former AP staffers Connie Cass and Jeff Wilson. AP National Writer Hillel Italie in New York contributed to this report.